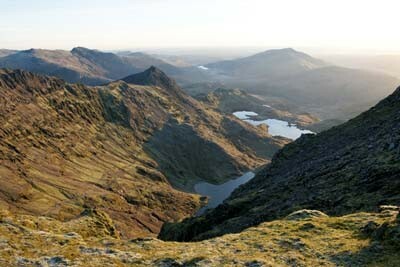 Snowdonia National Park is one of the main mountain walking regions in Britain. Occupying 838 square miles (217,100 hectares), it is Britain’s second largest National Park. The Snowdon massif lies in the north-west corner and stretches from Llanberis (three miles from Graianfryn) to Beddgelert. Most visitors head for the summit, Yr Wyddfa,which at 1085 m (3560 ft) above sea level is the highest British peak south of the Scottish border. The paths up Snowdon are so well-used and well-marked that it is almost impossible to lose your way in summer conditions and if you are reasonably fit you should be able to make the top even if you are not an experienced mountain walker. If you are, you can find plenty of exhilarating walks which test your navigational and scrambling skills. Pyg (or Pig) Track 3 miles Pen y Pass An easy path to follow though the last section, after it combines with the Miners Track, is fairly steep in places. Many walkers ascend by the Miners Track and return on the Pyg Track. Miners Track 3.5 miles Pen y Pass This is probably the most scenic and most popular path, passing over Llyn Llydaw via a causeway and then alongside Llyn Glaslyn with glorious mountain scenery all around. The path rises only 750ft to Llyn Glaslyn, by which time you have covered three-quarters of the distance, so you could just walk this far and turn back if you are not a strong walker. To reach the summit you climb 400ft up the scree then follow the Pyg Track. Watkin Path 3 miles Nant Gwynant Generally considered the hardest path as its starting point is only 190ft above sea level compared with Pen y Pass at 1170ft. There is plenty of interest en-route to the summit as you pass streams and mining relics while admiring the spectacular mountain views. The last section includes a steep scree slog. Rhyd Ddu Path 3.25 miles Rhyd Ddu Less dramatic and quieter than the paths on the Llanberis side of the mountain, this is nevertheless a very scenic path with lovely views near the summit. One section can get boggy in wet weather. Walking up the Rhyd Ddu Path and returning via the Snowdon Ranger makes a good circuit, with just a short section of road to join the paths at the bottom. Snowdon Ranger 3.5 miles Snowdon Ranger Y.H. An easy ascent, although one section can get boggy in wet weather. Joins the Llanberis path just before reaching the summit. The Snowdon Ranger was John Morton, who opened the inn, now a Youth Hostel. Llanberis Path 4 miles Llanberis This is the longest path to the summit and generally considered the easiest, though one or two sections are fairly steep. There are fine views of the Moel Eilio range, the Llanberis Pass and down into Cwm Dyli over the two lakes, Glaslyn and Llydaw. Pen y Pass The Snowdon Horseshoe is one of the finest ridge walks in Europe. It follows the Pig Track as far as Bwlch y Moch then strikes off to the right over Crib Goch, a narrow ridge only a foot wide in places and falling away steeply at both sides to gain the summit. You return via the two peaks of Yr Lliwedd and the join the Miners Track. Not to be attempted in windy conditions or if you suffer from vertigo. Snowdon Mountain Railway 4 miles Llanberis This is the easiest route of all. It is operated by a mixture of steam and diesel engines, which take an hour to reach the summit with a short break to allow you to admire the view and visit the cafe. Some of the steam engines date from the line’s inception in 1895.